To coincide with his opening at Thornebrook Gallery, Peter was the featured artist in Gallery, the art of life magazine for their fall issue. 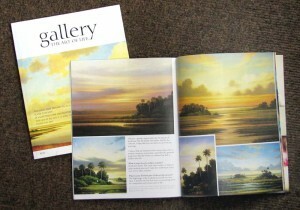 In addition to the front cover, the magazine devoted five pages of Peter’s paintings along with an interview about the inspiration for the landscapes that were present in his gallery showing. You are currently browsing the Peter Pettegrew blog archives for October, 2012.